Here you are able to browse through our vast range of wheelchairs, which we pride in being an amazing value for money. 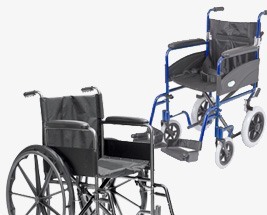 You will find a range of self-propelled, transit and bariatric wheelchairs available, with unique and essential features to suit your specific needs. We offer such brands as Z-Tec, Days, Roma and Drive Medical. We hope you find your ideal wheelchair that offers you the comfort, support and mobility you require.